Firstly fry the onion in oil in a medium size pot until light brown. Start to boil the rice in a large pot with salt. 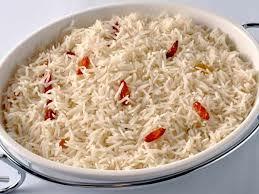 The rice should not be soft, it should be a little bit uncooked when you drain the rice after boiling. Remove onion from pot and set aside. Then put the chicken in the same pot you used to cook the onion and add 1 tablespoon salt and garlic. Saute until golden, then add tomato, bay leaf, chili powder, turmeric, garam masala, coriander powder, cloves, black pepper, brown cardamom and cinnamon sticks. Then fry for five minutes. Now pour one large drinking glass of water into the pan and cover it. Cook till the chicken is tender and about 1/2 cup water is remaining in the pot. Put half of the rice in chicken mixture and mix lightly. Sprinkle onions, green chilies and coriander strands into the pot. And spread the remaining half of the rice on top and cover lid tightly. The heat should be set on high for 2 minutes, then switched to low. Keep the heat on low for ten minutes. Finally turn the heat off and let the covered pot sit for 15 minutes. Fluff the rice with a fork, remove bay leaf and cinnamon sticks.